Incidents of floods which are mainly caused by changes in landuse is fast becoming a city life experience in Ilorin as in most urban centres in Nigeria causing untold hardships and sometimes loss of lives. 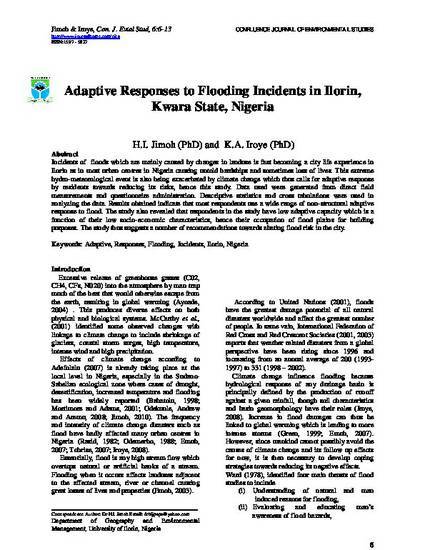 This extreme hydro-meteorological event is also being exacerbated by climate change which thus calls for adaptive response by residents towards reducing its risks, hence this study. Data used were generated from direct field measurements and questionnaire administration. Descriptive statistics and cross tabulations were used in analyzing the data. Results obtained indicate that most respondents use a wide range of non-structural adaptive response to flood. The study also revealed that respondents in the study have low adaptive capacity which is a function of their low socio-economic characteristics, hence their occupation of flood plains for building purposes. The study thus suggests a number of recommendations towards abating flood risk in the city.